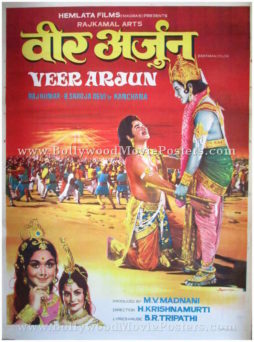 Indian mythology poster for sale of the old Bollywood movie Veer Arjun (1977). 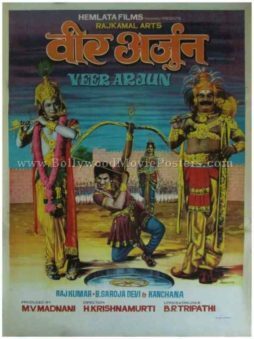 This is an actual surviving old Indian mythology movie poster of the 1977 Hindi film that was based on the legendary story of Prince Arjuna from the ancient Indian epic of the Mahabharata. Printed and circulated during the first release of the film (somewhere in the late 1970s), this Hindu mythology poster was printed for publicity of the film but never ended up being used. Arjuna is seen prominently in the center attempting to pierce the eye of a fish with an arrow by observing its reflection in the water. Lord Shree Krishna is seen playing a flute on the left side of the poster. The top of this Indian mythology poster is set against a beautiful background with broad visible brush strokes.